SLEEPY EYE — Faith United Methodist Church of Sleepy Eye is holding a roast pork loin supper on Thursday, March 22, from 4:30 to 7 p.m. at the church, 321 1st Ave. S., Sleepy Eye. Cost is $12 for adults, in advance, $13 at the door. Children aged 5-10 are $6 in advance, $7 at the door. The menu includes roast pork, scalloped potatoes, corn, apple sauce, buns and pickles, assorted pies and dessserts, and beverage. Take-outs available for adults only. NEW ULM — The Cathedral of the Holy Trinity will hold its all-you-can-eat Men�s Fish Fry on Friday, March 23, serving from 4 to 8 p.m. The menu includes batter fried cod, scalloped potatoes, cole slaw, corn, sherbet, coffee and milk. Take outs available. 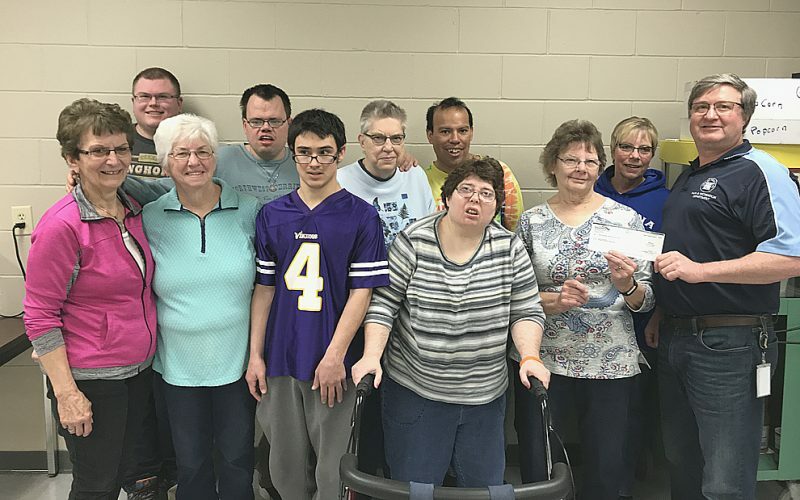 Raffle drawing at 8 p.m.
NEW ULM — St. Mary’s CCW will hold its Palm Sunday Brunch and Bake Sale on Sunday, March 25, from 9 a.m. to 12:30 p.m. in St. Mary’s Church, New Ulm. The menu includes ham, dausage and rggs, german potato salad, schmierkuchen, bread, applesauce, cake, coffee, juice, milk. NEW ULM The New Ulm Rotary Club announces its annual Scholars Banquet to be held on Monday, March 26, at Martin Luther College gymnasium beginning at 6:30 p.m. The 51st annual banquet recognizes students from all three local high schools that academically rank in the top 15 percent of their senior class. This year, 36 students will be honored at the banquet. The New Ulm Rotary Club also recognizes one student from each high school for the Service Above Self Award. This special award recognizes students for their efforts in these three areas: scholastic achievement, leadership among fellow students, and participation in extracurricular activities. Guest speaker for the event is Terry Morrow, former member of the Minnesota House of Representatives as well as a teacher at Gustavus Adolphus College. Banquet tickets are available from either high school office or from New Ulm Rotary Club members. Tickets may also be purchased at the door. REDWOOD FALLS — The New Ulm Diocese Council of Catholic Women is planning its 59th Annual Convention, hosted by St. Catherine’s in Redwood Falls on Saturday, April 28. The keynote speaker will be Nancy Jo Sullivan, who was born and raised in Minnesota. Her oldest daughter, Sarah, was born with Down’s Syndrome and after a brief stay on earth, now resides in heaven. During her 23 years, Sarah imparted lessons of faith that continue to impact lives. Nancy currently spends her time writing books, giving retreats, and serving as a presenter at grief coalitions. The day will begin with registration and breakfast at 7:30 a.m., and includes the keynote speaker in the morning, Holy Mass celebrated by Bishop John M. LeVoir, lunch, a silent auction, various displays, vendors, religious article suppliers, an afternoon speaker and concludes with the Divine Mercy Chaplet at 2:30 p.m. Registration information can be found at www.nudccw.org.